Before diving into our next Tea Time review, I want to give our readers at ABR a huge hug of gratitude! Your enthusiastic responses to our first Tea Time review (Tea Forté’s Oasis Green Tea) blew us away, and I really appreciate (and did my best to reply to) all of the comments you left. This is all the confirmation we needed to continue our Tea Time at Reverie series and bring you thoughtfully written tea reviews that appeal to your senses and help you decide if it’s worth trying. So, thank you again, and I hope you keep coming back for each Tea Time! Today’s edition features one of the teas that sparked my “tea-volution” about 2 years ago. ToLife®, made and sold by loose-leaf tea giant Teavana, is considered a white tea but is actually a blend of white, rooibos, and jasmine. Sounds heavenly, doesn’t it? Even the presentation in the above photo speaks volumes: ToLife® is one of the prettiest teas you’ll lay eyes on, and it entices you even more once it’s in your cup. 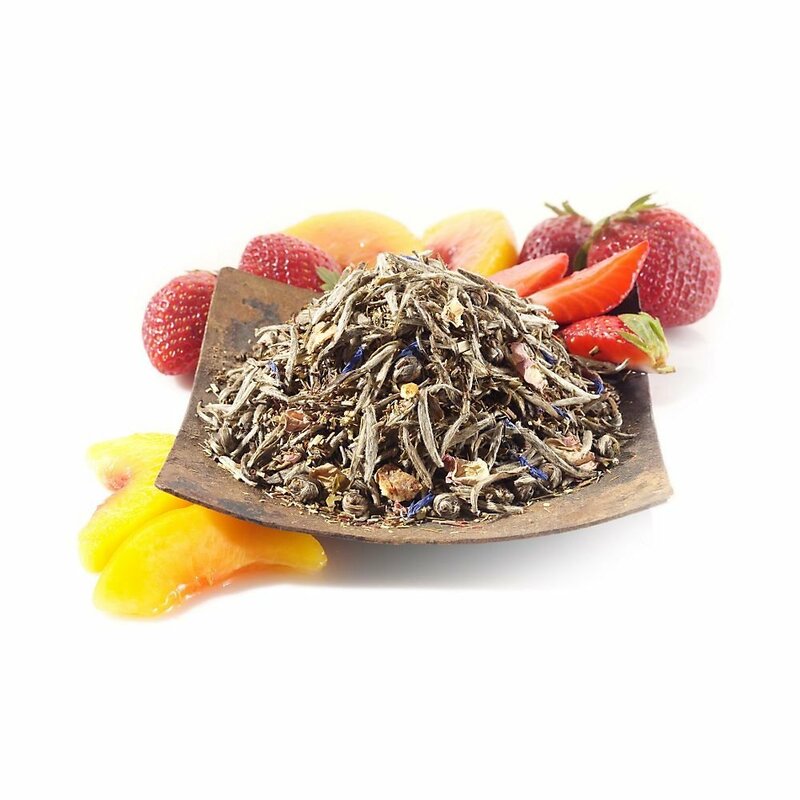 Ingredients: Silver Needle white tea, Jasmine Dragon Phoenix Pearls green tea, green rooibos, citrus peels, red rooibos, candied papaya pieces (papaya, sugar), peach pieces, strawberry pieces, rosebuds, natural and artificial flavoring, rhubarb pieces, and marigold petals. Steeping Instructions: Use 1.5 to 2 tsp of tea per 8oz of water. Heat water to just under boiling (175 degrees Fahrenheit / 79 degrees Celsius) and steep for 2 minutes. Opening a canister of ToLife® is like opening a treasure chest. There’s so much to see – tiny rooibos sprigs, banana-shaped silver-green buds (Silver Needle), rolled balls of jasmine leaves, dried rosebuds, and all the little fruit pieces listed above, with strawberry being the most common. Each teaspoon of this tea differs from the last for this reason. Sometimes it brings up mostly rooibos and fruit, other times jasmine rolls with silver needles. The variety explains why each cup of ToLife® offers a unique experience to tea drinkers. Now, ToLife®’s aroma…. Ohhhhhhh. Imagine fruity, floral, and jasmine mingling together in a seductive dance that whispers, “Come try me.” The fruitiness emerges more once the tea’s been brewed, but it’s not cloying. And, the brew’s golden-orange color is breathtaking. I’d go so far as to describe this tea as sunrise-colored, since I see a pinkish hue in there too. I’m used to brewing ToLife® for about 4 minutes. That was Teavana’s recommended brew time when I first tried the tea, and I’ve stuck to it since then. And when steeped for that amount of time, ToLife® delivers on all its promises. You get a bright, sweet cup of perfectly balanced floral and fruit, with hints of jasmine, and a cleansing smoothness from start to finish. It’s also more delicate than the initial aroma implies. I consider that a strength, though, because the drink still presents a surprising array of flavors. If ToLife® were any heavier, it might come out syrupy (yuck!) and too bombastic in flavor, as some fruity teas do. I was curious, though: How would ToLife® taste when steeped for only 1 to 2 minutes, as Teavana calls for now? For the sake of this review, I experimented with the shorter brew time… and it’s not bad. The color and fragrance is about the same as with the 4-minute brew, but the taste lacks the nuances it should have. (The jasmine, for example, is barely detectable.) Those extra couple minutes therefore prove to be crucial in making a true quality cup of ToLife®. Raise a toast, indeed! With its fusion of herbal, sweetness, and jasmine, ToLife® is the ambrosia of blended teas. It’s an ideal choice for unwinding after a stressful day or achieving a “vacation” state of mind. Apart from the teaseller’s recommended brew time (I say go for 4 minutes instead of the 1 to 2 range), my only caution would be with ToLife®’s delicacy. “Tea-thusiasts” who prefer more robust brews may find this one too subtle for their liking. That said, I love everything about ToLife® and highly recommend it to all tea drinkers, especially anyone who’s new to tea. It may be early in our Tea Time series to give a perfect grade, but this one is well deserved. You can purchase ToLife® White Tea at Teavana’s website or at your nearest Teavana location (currently limited to United States, Canada, and Mexico). In addition to being a tea enthusiast, Sara Letourneau is an avid reader and a writer who… well, enjoys writing! Currently she’s working on a novel, and she writes CD reviews, book reviews, and occasional articles on the craft of writing. She’s also a published poet with works avaiable in print and online publications. Visit Sara at her personal blog, Facebook, or Twitter. Sara, I’m not into tea but your description above makes me want to run to the store. Good job in sharing your passion. I like the sound of the candied papaya pieces in this one!